Kisan Baburao Hazare About this sound pronunciation (born 15 June 1937), popularly known as Anna Hazare About this sound pronunciation is an Indian social activist who led movements to promote rural development, increase government transparency, and investigate and punish official corruption. In addition to organizing and encouraging grassroots movements, Hazare frequently conducted hunger strikes to further his causes—a tactic reminiscent, to many, of the work of Mohandas K. Gandhi. Hazare also contributed to the development and structuring of Ralegan Siddhi, a village in Parner taluka of Ahmednagar district, Maharashtra, India. He was awarded the Padma Bhushan—the third-highest civilian award—by the Government of India in 1992 for his efforts in establishing this village as a model for others. Anna Hazare started an indefinite hunger strike on 5 April 2011 to exert pressure on the Indian government to enact a stringent anti-corruption law, The Lokpal Bill, 2011 as envisaged in the Jan Lokpal Bill, for the institution of an ombudsman with the power to deal with corruption in public places. The fast led to nation-wide protests in support. The fast ended on 9 April 2011, a day after the government accepted Hazare's demands. The government issued a gazette notification on the formation of a joint committee, consisting of government and civil society representatives, to draft the legislation. For the year 2011 Foreign Policy magazine named him among top 100 global thinkers.Also in 2011 Anna was ranked as the most influential person in Mumbai by a national daily newspaper. He has faced criticism for his authoritarian views on justice, including death as punishment for corrupt public officials and his alleged support for forced vasectomies as a method of family planning. Kisan Hazare was born on 15 June 1937 (some sources say 1940) in Bhingar, near Ahmednagar. He was the eldest son, with two sisters and four brothers. He later adopted the name Anna, which in Marathi means "elder person" or "father". His father worked in a pharmacy and struggled to support the family financially. In time, the family moved to their ancestral village of Ralegan Siddhi, where they owned a small amount of agricultural land. A relative took on the burden of providing Kisan with an education, taking him to Mumbai because the village had no primary school. The relative became unable financially to continue the support and Kisan's schooling ended in the Standard Seventh grade; his siblings never attended schoolHe started selling flowers at the Dadar railway station in Mumbai and eventually managed to own two flower shops in the city. He also became involved in vigilantism, joining groups who acted to prevent landlords' thugs from intimidating the poor out of their shelter. The Indo-China War of 1962 caused the Indian Army to commence emergency recruitment measures. Hazare was drafted in April 1963, despite not meeting the physical requirements, and was attested as a soldier on 16 November of that year after undertaking training at Aurangabad. During the Indo-Pakistani War of 1965, Hazare was posted at the border in the Khem Karan sector. He was the sole survivor of an enemy attack—variously claimed to have been a bomb, an aerial assault and an exchange of fire at the border—while he was driving a truck. The experiences of wartime, coupled with the poverty from which he had come, affected him. He considered suicide at one point but turned instead to pondering the meaning of life and death.He said of the truck attack, "[It] sent me thinking. I felt that God wanted me to stay alive for some reason. I was reborn in the battlefield of Khem Karan. And I decided to dedicate my new life to serving people. "He spent his spare time reading the works of Swami Vivekananda, Gandhi, and Vinoba Bhave. In a blog post, Hazare expressed his views on Kashmir by saying that it was his "active conviction that Kashmir is an integral part of India" and that if required once again for service, he would remain "ready to take part in war against Pakistan." During the mid-1970s, Hazare survived a road crash while driving for the army. He interpreted his survival as a further sign that his life was intended to be dedicated to service. Despite subsequent allegations that he had deserted from the army, official records show that he was honourably discharged in 1975 after completing 12 years of service. Hazare and the youth group decided to take up the issue of alcoholism to drive a process of reform. At a meeting conducted in the temple, the villagers resolved to close down liquor dens and ban alcohol in the village. Since these resolutions were made in the temple, they became, in a sense, religious commitments. Over thirty liquor brewing units voluntarily closed their establishments. Those who did not succumb to social pressure were forced to close their businesses when the youth group smashed their premises. The owners could not complain as their businesses were illegal. Hazare appealed to the government of Maharashtra to pass a law whereby prohibition would come into force in a village if 25% of the women in the village demanded it. In 2009 the state government amended the Bombay Prohibition Act, 1949 to reflect this. In 1980, Hazare started the Grain Bank at the temple, with the objective of providing food security to needy farmers during times of drought or crop failure. Rich farmers, or those with surplus grain production, could donate a quintal to the bank. In times of need, farmers could borrow the grain, but they had to return the amount of grain they borrowed, plus an additional quintal as an interest. This ensured that nobody in the village ever went hungry or had to borrow money to buy grain. This also prevented distress sales of grain at lower prices at harvest time. As a secondary occupation, milk production was promoted in Ralegan Siddhi. Purchase of new cattle and improvement of the existing breed with the help of artificial insemination and timely guidance and assistance by a veterinarian improvemd the cattle stock, increasing milk production. In 1932, Ralegan Siddhi got its first formal school, a single classroom primary school. [clarification needed] In 1962, the villagers added more classrooms through community volunteer efforts. By 1971, out of an estimated population of 1,209, only 30.43% were literate (72 women and 290 men). Boys moved to the nearby towns of Shirur and Parner to pursue higher education, but girls were limited to primary education. Hazare, along with the youth of Ralegan Siddhi, worked to increase literacy rates and education levels. In 1976 they started a pre-school and a high school in 1979. The villagers formed a charitable trust, the Sant Yadavbaba Shikshan Prasarak Mandal, which was registered in 1979. Most rural poor get into a debt trap as they incur heavy expenses at the time of marriage of their daughter or son. It is an undesirable practice but has become a social obligation in India. Instead, Ralegan's people started celebrating marriages collectively. Joint feasts are held, where expenses are further reduced by the Tarun Mandal taking responsibility for cooking and serving the food. The vessels, the loudspeaker system, the mandap, and the decorations have also been bought by the Tarun Mandal members belonging to the oppressed castes. From 1976 to 1986, 424 marriages have been held under this system. Article 47 of India's Constitution commits the State to raise the standard of living, improve public health and prohibit the consumption of intoxicating drinks and drugs injurious to health. In 2007 Maharashtra rolled out a grain-based liquor policy aimed to encourage production of liquor from food grain in light of the rising demand for spirits—used for industrial purposes and liquor. It issued 36 licenses for distilleries for making alcohol from food grains. Anna Hazare opposed the government's policy to promote making liquor from food grains. He argued that Maharashtra had to import food and referring to food grains observed that promoting producing liquor from food grains was nappropriate.One of the State ministers Laxman Dhoble said in his speech that those opposing the decision to allow use of food grains for the production of liquor were anti-farmers and that opponents should be beaten with sugarcane sticks. Hazare began fasting at Shirdi, but on 21 March 2010 the government promised to review the policy and Anna ended his 5 day long fast. But the government later granted 36 licences and grants of INR10 (US$0.18) (per litre of alcohol) to politicians or their sons who were engaged in making alcohol from foodgrains. Recipients included Amit and Dheeraj Deshmukh, sons of Union Heavy Industries Minister Vilasrao Deshmukh, Bharatiya Janata Party leader Gopinath Munde's daughter Pankaja Palwe and her husband Charudatta Palwe, sons-in-law of P.V. Narasimha Rao and Rajya Sabha MP Govindrao Adik.The government approved the licenses despite stiff opposition from the planning and finance departments, saying there was a huge demand in other countries for distilled spirits compared to that of molasses. 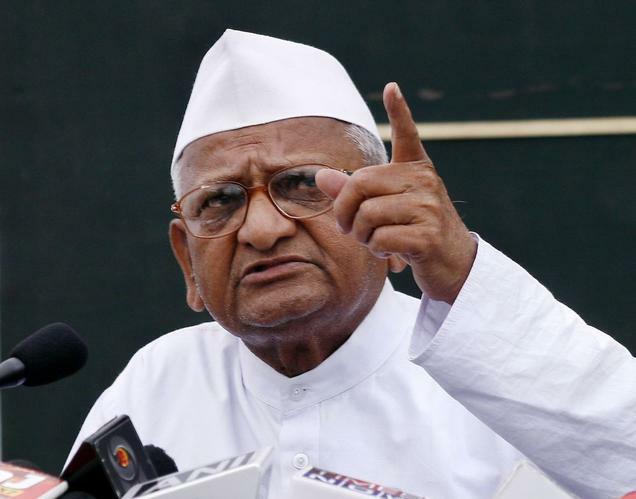 Anna sued Maharashtra over the policy in the Nagpur bench of the Bombay High Court. On 20 August 2009 Maharashtra stopped the policy. However, distilleries sanctioned before that date and those who started production within two years of sanction were entitled for subsidies. On 5 May 2011 court refused to hear the suit, saying, "not before me, this is a court of law, not a court of justice" as a reason for not hearing the plea.A Maharashtra Principal Secretary, C.S. Sangeet Rao, stated that no law existed to scrap these licences. Hazare began his Indefinite Fast on 5 April 2011 at Jantar Mantar in Delhi to press for the demand to form a joint committee of the representatives of the Government and the civil society to draft a stronger anti-corruption bill with stronger penal actions and more independence to the Lokpal and Lokayuktas (Ombudsmen in the states), after his demand was rejected by Prime Minister Singh. He stated, "I will fast until Jan Lokpal Bill is passed". The movement attracted attention in the media, and thousands of supporters. Almost 150 people reportedly joined Hazare in his fast. Social activists, including Medha Patkar, Arvind Kejriwal, former IPS officer Kiran Bedi, and Jayaprakash Narayan lent their support. People showed support in social media. In addition to spiritual leaders Sri Sri Ravi Shankar, Swami Ramdev, Swami Agnivesh and former Indian cricketer Kapil Dev, many celebrities supported him. Hazare decided that he would not allow any politician to sit with him. The protesters rejected Uma Bharti, Om Prakash Chautala and others when they visited the protest. On 6 April 2011 Sharad Pawar resigned from the group of ministers formed for reviewing the 2010 draft. Protests spread to Bangalore, Mumbai, Chennai, Ahmedabad, Guwahati, Shillong, Aizawl and other cities. On 8 April the Government accepted the movement's demands. On 9 April it issued a notification in the Gazette of India on formation of a joint committee. It accepted the formula that there be a politician chair and an activist, non-politician co-chair. The notification stated, “The Joint Drafting Committee shall consist of five nominee ministers of the Government of India and five nominees of the civil society. The five nominee Ministers of the Government of India are Pranab Mukherjee, Union Minister of Finance, P. Chidambaram, Union Minister of Home Affairs, M. Veerappa Moily, Union Minister of Law and Justice, Kapil Sibal, Union Minister of Human Resource and Development and Minister of Communication and Information Technology and Salman Khursheed, Union Minister of Water Resources and Minister of Minority Affairs. The five non-politician nominees were Anna Hazare, N. Santosh Hegde, Shanti Bhushan Senior Advocate, Prashant Bhushan, Advocate and Arvind Kejriwal. On the morning of 9 April Hazare ended his 98-hour hunger strike. He addressed the people and set a deadline of 15 August to pass the bill. Anna Hazare said that if the bill did not pass he would call for a mass nation-wide agitation. [dead link] He called his movement as "second struggle for independence" and he will continue the fight. Anna Hazare threatened on 28 July 2012 to proceed with his fast-unto-death from tomorrow on the Lokpal issue. He also stated that country's future is not safe in the hands of Congress and BJP and he would campaign in the coming elections for those with clean background. On the third day of his indefinite fast, Anna stated that he will not talk even to the Prime Minister till his demands are met. On 2 August 2012 Anna said that there was nothing wrong in forming a new political party but, he would neither join the party nor contest elections. Team and Anna have decided to end their indefinite fast on 3 August 2012 at 5PM after which the team will announce their decision to enter politics. During the meeting of the joint drafting committee on 30 May, the Union government members opposed the inclusion of the prime minister, higher judiciary and the acts of the MPs under the purview of the Lokpal in the draft bill. On 31 May, Mukherjee sent a letter to the chief ministers of all states and party leaders seeking their opinion on six contentious issues, including whether to bring the prime minister and judges of India's Supreme Court and High Courts under the law's purview. But the civil society members of the drafting committee considered that keeping them out would be a violation of the United Nations Convention against Corruption. Anna Hazare and other civil society members decided to boycott the 6 June drafting committee meeting to protest the forcible eviction of Swami Ramdev and his followers by the Delhi Police from Ramlila Maidan on 5 June, while they were on a hunger strike against black money and corruption and doubting the government's seriousness. On 6 June, the civil society members wrote to Mukherjee, explaining reasons for their absence and also asking government to go public on the major issues. They also decided to attend only future meetings that were telecast live.On 8 June at Rajghat, describing his movement as the second freedom struggle, Anna criticised the Government for trying to discredit the drafting committee and threatened to go on indefinite fast again from 16 August if the Lokpal Bill had not passed. He also criticised the Government for putting hurdles in front of the Bill and for maligning the civil society members. Within twenty four hours of cabinet's endorsement of a weak Lokpal Bill, over ten thousand people from across the country sent faxes directly to the government demanding a stronger bill. The Mumbai Taxi Men’s Union, comprising over 30,000 taxi drivers supported Hazare’s fast by keeping all taxis off the roads on 16 August.Lawyers of Allahabad High Court described the government proposal as against the national interest and pledged their support to Hazare by hunger striking at Allahabad on 16 August. On 1 August, Public interest litigation was filed in the Supreme Court of India by Hemant Patil, a Maharashtra-based social worker and businessman, to restrain Hazare, alleging that Hazare's demands were unconstitutional and amounted to interference in the legislative process. Anna Hazare has been criticized for being an agent of Rashtriya Swayamsevak Sangh (RSS) a right-wing Hindu body.United Progressive Alliance, the present ruling government in India has seldom made that charge. According to Digvijay Singh a senior leader of the Indian National Congress the entire crusade of 2011 Indian anti-corruption movement was planned by RSS in which Plan-A was Baba Ramdev while Plan-B was Anna Hazare. Their basic job was to disturb national security. Further Digvijay Singh had charged Hazare for having links with late RSS leader Nanaji Deshmukh with whom he worked as a secretary Anna denied any such associations. A cardiologist from Pune, Abhijit Vaidya—founder of Arogya Sena, a non-governmental agency active in public health, disaster management and social campaigns—claimed that he was informed by Hazare's close associates that during a fast in Ralegan-Siddhi, Hazare was given glucose and electrolyte solutions during a fast. Hazare and his associates refused to comment on the allegation. Anna Hazare is unmarried. He has lived in a small room attached to the Sant Yadavbaba temple in Ralegan Siddhi since 1975. On 16 April 2011, he declared his bank balance of INR67,183 (US$1,220) and INR1,500 (US$30) as money in hand. He owns 0.07 hectares of family land in Ralegan Siddhi, which is being used by his brothers. He donated for village use two other pieces of land donated to him by the Indian Army and by a villager. On 22 August 2011 writer-actor Arundhati Roy accused Hazare in a newspaper article of being nonsecular. She questioned his secular credentials, pointing out his "support for Raj Thackeray's Marathi Manoos xenophobia and [has praised] the 'development model' of Gujarat's CM who oversaw the 2002 pogrom against Muslims". The website of the newspaper published many responses to her article and these were mostly critical of her views. Activist Medha Patkar criticised Roy, saying that her views were misplaced. After staying away from the limelight for several months following a split between him and Arvind Kejriwal, Anna Hazare is all set to get back to campaigning against corruption from Wednesday. An NDTV report says that Hazare is all set to launch a country-wide ‘Vyawastha Parivartan’ (change in system) programme and address a “Jantranta rally” in Patna today. Ahead if his rally, Hazare slammed the UPA government for the delay in passing the Lokpal Bill. The Central government has been cheating us over the issue (passing the Lokpal Bill),” Hazare said at a press conference in Patna. In reference to United Progressive Alliance (UPA) chairperson Sonia Gandhi‘s letter to him in which she promised that the Lokpal Bill will be passed in coming session of parliament, Hazare said that there was nothing new in the letter. “I have been assured through letters for last two years that Lokpal Bill will be passed soon but it is yet to pass,” he said. On choosing Patna for the campaign, Mr Hazare said Bihar was a ‘pious land’ as Gandhiji had launched Satyagraha against the British rule from Champaran and JP his ‘sampoorna kranti’ (total revolution) from here, besides being the land of Gautam Buddha, NDTV reported. Hazare claimed that the government had no intention of ending corruption. “The government’s intention is not clear on this issue,” he said. Hazare was welcomed by hundreds of his supporters at the airport on Tuesday when he arrived ahead of his rally. Hazare, who is staying at legendary socialist leader Jayaprakash Narayan’s house here, said that Patna has been chosen to follow the legacy of JP’s (as Narayan was popularly known) anti-corruption movement and to fulfill his dream of total revolution. He announced that after the Patna rally, he will visit four other states in February and other states from March to create awareness among people and to unite them for change in the system in the country. Hazare asserted that he will continue his fight for changing the system till he is alive. An Indian activist has begun his fifth hunger strike in 16 months to push for anti-corruption legislation, but failed to draw the huge crowds that marked the start of his campaign. A year ago, tens of thousands of middle-class Indians crowded into a New Delhi fairground – enduring both pouring rain and sweltering heat. They were there to pledge support for Anna Hazare as he went without food and water for 12 days to press the government to create a wide-ranging anti-corruption watchdog. On Sunday afternoon, the frail 75-year-old managed to attract only a few thousand people. Three of his supporters have been fasting at the site since last Wednesday. The activists are trying to force the government to take up an anti-corruption bill when parliament resumes on 8 August. Hazare and his backers are also demanding an investigation into corruption allegations against 14 cabinet ministers. Hazare, a former army truck driver and social activist from western India, touched a nerve in a country where nearly everyone has paid bribes when he began battling for a powerful ombudsman, newspaper columnist and political commentator Inder Malhotra said. "But he didn't know how to mobilise that momentum and the protest lost its edge," Malhotra added. Hazare began with a five-day fast in April last year, which ended when the government invited members of his group to help draft anti-corruption legislation. In August, he fasted for 12 days to press parliament to pass a proposal to create a powerful watchdog that would police everyone from the prime minister, Manmohan Singh, to the lowest village bureaucrat. Government-proposed legislation to create a corruption ombudsman – which Hazare has called weak and ineffective – passed the lower house of parliament last year but has stalled in the upper house. Hazare tapped into public anger over a series of corruption scandals, including $4bn (£2.7bn) that disappeared during the 2010 Commonwealth Games, and a mobile phone-spectrum licensing scandal that is estimated to have cost the government up to $36bn in lost revenue. There was round-the-clock television coverage of his campaign last year, but the media coverage has become muted. Several factors played a part in Hazare's movement losing its sheen, according to Malhotra. • Charges of impropriety and corruption tainted some members of his group, often referred to "Team Anna". • Hazare also began to appear with the leaders of the Hindu nationalist opposition party while severely criticising the governing Congress party. The move dented his image as an impartial activist above partisan politics. • The movement lost much of its steam last December when Hazare planned an enormous rally in Mumbai and a hunger strike. Supporters pledged to fill jails by courting arrest. The demonstration flopped and the fast was called off. • Hazare's repeated use of hunger strikes as a form of political protest has worn thin. "You can't use the same weapon so many times," Malhotra said. He said Gram Sabha is bigger than the Lok Sabha in Delhi. The villages should be made autonomous where without the permission of Gram Sabha, no government or corporate body can purchase farmers' land. Hazare had earlier said in a public meeting in Patna that his Jantantra Morcha had been formed to serve the public but its members will not contest the election. Hazare said since Unnao was the birthplace of Chandra Shekhar Azad, the farmers movement should start from here. He said he will travel across the country for a year to awaken the youth. Calling his movement the "second struggle of freedom", he said, "If people take part, the movement will help bring freedom. If people are united, government would be compelled to pay attention to our demands." Speaking at the rally, former Army Chief General V K Singh said, "Nearly 98% soldiers in the Indian Army are sons of farmers, hence, I am aware of the hardships of farmers. If we do not unite there would be no end to our sufferings." The farmers, however, claim it was the biggest rally in Unnao in the last 10 years. It was organised by the Kisan Manch and chairman of World Sufi Council, Maulana Sufi Jilani, was also present in the rally.